I sometimes ask myself how it came about that I was the one to develop the theory of relativity. The reason, I think, is that a normal adult never stops to think about the problem of space and time. These are things which he has thought of as a child. But my intellectual development was retarded, as a result of which I began to wonder about space and time only when I had already grown up. In Ronald W. Clark, Einstein: The Life and Times (1971), 10. It has often been said, and certainly not without justification, that the man of science is a poor philosopher. Why then should it not be the right thing for the physicist to let the philosopher do the philosophising? Such might indeed be the right thing to do a time when the physicist believes he has at his disposal a rigid system of fundamental laws which are so well that waves of doubt can't reach them; but it cannot be right at a time when the very foundations of physics itself have become problematic as they are now … when experience forces us to seek a newer and more solid foundation. ‘Physics and Reality’, Franklin Institute Journal (Mar 1936). Collected in Out of My Later Years (1950), 58. 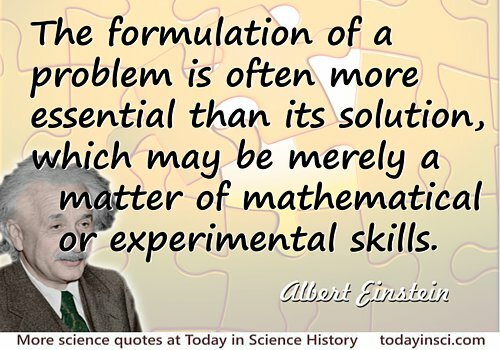 The formulation of a problem is often more essential than its solution, which may be merely a matter of mathematical or experimental skill. To raise new questions, new possibilities, to regard old problems from a new angle requires creative imagination and marks real advances in science. In Albert Einstein and Léopold Infeld, The Evolution of Physics: The Growth of Ideas from Early Concepts to Relativity and Quanta (1938, 1966), 92. Quoted in Forbes (15 Sep 1974). In Larry Chang, Wisdom for the Soul (2006), 179. ~~[Reinterpretation]~~ The significant problems we face cannot be solved at the same level of thinking we were at when we created them. Yet another of the Einstein-like quotes in common circulation for which there appears to be no known source in the given wording. There are also a number of variations on the the theme. It resembles an authentic quote, “A new type of thinking is essential if mankind is to survive and move toward higher levels,” from a longer discussion, in 'Atomic Education Urged by Einstein', New York Times (25 May 1946), 13. Other reinterpretations, not in exactly Einstein’s wording, include: “No problem can be solved from the same level of consciousness that created it.” “The world will not evolve past its current state of crisis by using the same thinking that created the situation.” “The significant problems we have cannot be solved at the same level of thinking with which we created them.” “The world we have made, as a result of the level of thinking we have done thus far, creates problems we cannot solve at the same level of thinking at which we created them.” For more context, see the authentic quote that begins, “Our world faces a crisis as yet unperceived…,” on the Albert Einstein Quotes page on this website.